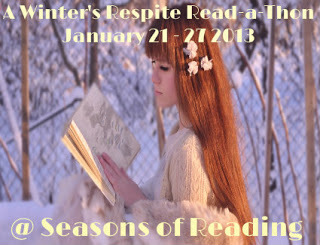 It's time to begin the A Winter's Respite Read-a-Thon, hosted by Seasons of Reading! Lasher is 628 pages long, which wouldn't be unreasonable to finish in a week, except that Anne Rice books tend to have tiny printing, and are not exactly fluff! The Witching Hour, which is about double the length of Lasher, took me a whopping 6 weeks! So I'm really going to challenge myself this week and see how much of Lasher I can get done. As for how much time I'll be dedicating to reading this week, it's hard to say. I'm currently unemployed, but I do have an interview tomorrow (yay!). So if I get hired quickly I might end up with a shift or two this week. Other than that, I have plans a couple of evenings, but I'm not crazy busy, so I should have a lot of reading time! Good luck to everyone who's participating! Happy reading! Well, thank goodness that's done. I did not enjoy that book. Anywho, now I'm going to finish Bright Star. My lack of progress was getting me down, so I'm just going to wait a while before my next update. I don't really want to keep updating just to say that I'm not done Bright Star yet so I still haven't started Lasher. I kinda messed up on my goals on this one! I liked Bright Star, but I'm happy to be reading Lasher now, since that was supposed to be my read-a-thon goal! I still have the weekend, so I'm still hoping to get a good chunk of it read. Well, I might have had a bit of a slow start to this read-a-thon, but I certainly ended it well! I'm nearly a third of the way through Lasher, which is more than I'd hoped to finish this week. Welcome! I say, what better way to spend a read-a-thon then reading Anne Rice? I wish she was on my pile this week. Thanks for joining me again, Lianne. I'm wishing you success in finishing Lasher! It's been too long since I've read anything by Anne Rice. I really like the Mayfair Witches series. This is my first time reading this series, though I'm a long time Vampire Chronicles fan. I'm liking it so far!